Re: Ultratherm UTH and thermostat or dimmer? I don't use a thermostat. But I know many do. Your ultratherm should cover the entire bsck of your tank from the top of the substrate to lip of tank. We use $20 regulators from Amazon with a probe that goes into the tank. We currently use two Ultratherms on our tanks to keep the thanks in the mid 80's. The side UTH we keep plugged in at all times with no thermostat. The side heaters are only used from October-April when our house is cooler. The Main Heater on the rear wall we have the thermostat on. That method along with insulation keeps our tanks in our desired temperature range. I believe a thermostat is a thermostat. I don't believe it would matter if it is intended to germinate seeds, warm hermit crabs or brewing beer. As long as it does what it needs to do and fits the wattage requirements you need anything should work fine. Similar to how you can purchase $5 bags five pounds of sand at a pet store or go to Lowes and get a 50 pound bag for the same price. These are the ones we purchased in May of 2018. All thermostats are not created equal! The question is, if it malfunctions, is the temperature at either end of the possible extremes (full off or full on) enough to kill or burn the animal? For hermits it's not much of a concern usually, it'll get a little too hot or cold but not enough to cause permanent harm. For basking animals who could end up with severe burns, it is life or death. 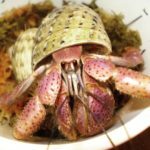 A cheap thermostat is normally just fine to use with a hermit crab, but for reptiles you need something with safety systems in place.